TUCSON, ARIZ. AND BEVERLY SHORES, IND., 24 June 2014 — Nights along the south shore of Lake Michigan are a little darker thanks to dedicated residents of one northwest Indiana community. In recognition of their efforts to protect the nighttime environment along the Indiana Dunes, the International Dark-Sky Association (IDA) today announced it has named the Town of Beverly Shores, Indiana, as the world’s seventh International Dark Sky Community. Residents have long been concerned about the effects of excess artificial light at night in Beverly Shores; the Town Council first adopted regulations on outdoor lighting in 1983. To help achieve accreditation from IDA, the Council significantly expanded the provisions of the Town’s lighting ordinance. The Association of Beverly Shores Residents (ABSR), under the leadership of Board and Environment Committee members Rosemary and Alan Bell, undertook an initiative to educate property owners about the importance of dark skies, providing examples of methods for retrofitting existing, poor-quality light fixtures. ABSR President William S. Gilmer credits this collaborative community spirit for today’s award. “The concerted efforts of our town government, community association, businesses and individual residents to reduce all sources of light pollution in our town have been an exemplary model of a community working together toward a primary goal,” Gilmer said. 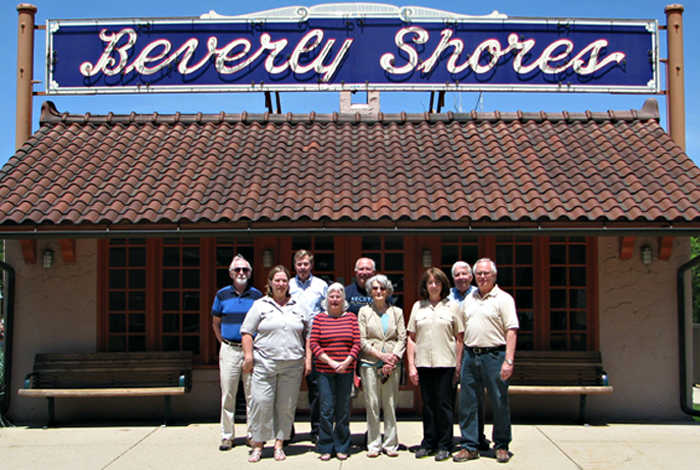 Beverly Shores began life as a planned resort community when the Frederick H. Bartlett Company, at the time one of Chicago’s largest real estate developers, bought 3,600 acres (1,500 ha) in 1927, and plotted thousands of home sites. The Great Depression killed the project and most of the planned homes were never built. Robert Bartlett, Frederick Bartlett’s brother, purchased the land in 1933 and named the development after his daughter Beverly. Bartlett further developed its infrastructure with roads, a school, a golf course and a hotel. In the postwar era, the rapid development of Chicago exurbs in the direction of the Town led to environmental degradation, and by the 1950s environmental groups began to push for conservation of the area’s beaches and adjoining wetlands. The National Lakeshore was established in 1966 and now hosts some of the most ecologically diverse lands in the region. With growth came outdoor lighting installations previously unknown in this largely wilderness area. However, towns like Beverly Shores principally attracted residents seeking a respite from the bustling city life of Chicago who preferred living in a more natural setting. Beverly Shores residents have long treasured The Island’s location in the wild confines of the Dunes. In recent years, they have embraced dark-skies as an important part of the local environment drawing residents and tourists alike. Beverly Shores residents have demonstrated their commitment to controlling the growth of outdoor lighting in their town through a series of retrofits and replacements of residential and commercial light fixtures. After the Town Council concluded that municipal funding was unavailable to replace or retrofit all light-polluting, publicly owned street lighting, the project was undertaken when ABSR raised $8,000 toward its total cost of $9,350 from local residents. 13 of the original 61 streetlights in Beverly Shores were retired, while the remainder was replaced with dark-sky-friendly high-pressure sodium fixtures. Responsible outdoor lighting in Beverly Shores helps protect many species living in the Dunes. “The National Park Service applauds the progressive steps that the Town is taking to mitigate the effects of light pollution in the area and pledges its support to assist in making this a successful venture,” said Garry M. Traynham, Acting Superintendent of Indiana Dunes National Lakeshore. IDA established the International Dark Sky Places conservation program in 2001 to recognize excellent stewardship of the night sky. Designations are based on stringent outdoor lighting standards and innovative community outreach. Since the program began, seven Communities, 16 Parks and eight Reserves have received International Dark Sky designations.